We ordered the remote with our logs and it works very well. It's so much easier to turn on and off without getting up every time. So glad we made this purchase. Highly recommended. ProCom's WAN Series Vented Gas Logs feature fully detailed hand painted logs logs, beautiful yellow flame designs, and a brilliant emberbed bring the realism of a roaring fire into your home. Available in 18 inch or 24 inch sizes. 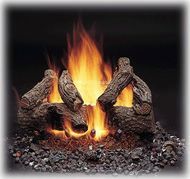 Monessen's American Oak Vented Gas Logs offer the ultimate in a big flame presentation. 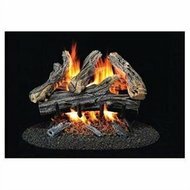 Massive logs, wild yellow flames, and a brilliant emberbed bring the realism of a roaring fire into your home. Available in 18 inch (VWF18NAO), 24 inch (VWF24NAO), or 30 inch (VWF30NAO) lengths.